State President Tran Dai Quang delivers opening remarks as Summit gets underway on November 8. The APEC CEO Summit 2017 opened in the central city of Da Nang on the afternoon of November 8, as part of the 2017 APEC Economic Leaders’ Week. 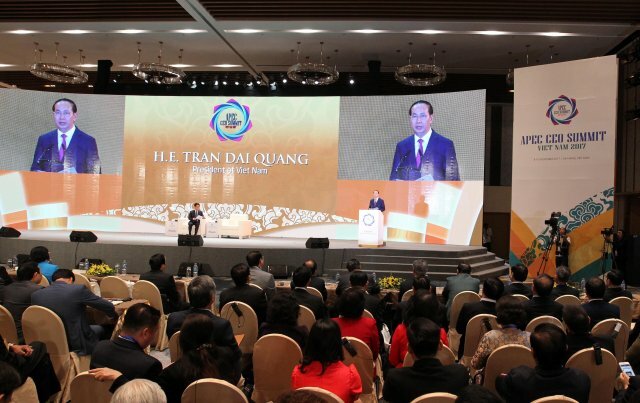 State President Tran Dai Quang and leaders from APEC economies such as Australia, Chile, China, Hong Kong - China, Malaysia, New Zealand, Papua New Guinea, Peru, the Philippines and the US attended the event. The Summit was also attended by representatives from 800 Vietnamese businesses and more than 2,000 leading businesses in the Asia-Pacific region, as well as leaders from international organizations such as the WB, the ADB, the WEF, the OECD, and the AIIB. State President Tran Dai Quang addresses the opening session of the APEC CEO Summit. The following is the full text of President Quang’s address. On behalf of the State and people of Vietnam, I have the great pleasure of warmly welcoming you all to the APEC CEO Summit 2017 in the coastal city of Da Nang, a leading economic development hub in central Vietnam. This is the biggest event of this kind for the regional business community and is attended by leaders from APEC member economies and representatives from international organizations and over 2,000 leading businesses. Your overwhelming participation here today demonstrates your responsibility and commitment to joining hands in building an ever more prosperous Asia-Pacific. With the theme “Creating New Dynamism, Fostering a Shared Future” and a rich and substantive agenda, I am convinced that the Summit will open up great opportunities for cooperation and development. Throughout nearly three decades of evolution, APEC has not only witnessed turning-point changes in the world but also been part of these changes. As a premier regional economic forum, APEC has recorded many important achievements in economic and social development and lifted hundreds of millions of people out of poverty. It has become the most effective economic cooperation mechanism in promoting the role of businesses and transforming the Asia-Pacific region into a driver of global growth and integration as well as the incubator of new ideas for the future. These achievements were not possible without crucial contributions from the Asia-Pacific business community that you represent. Thanks to the essential contributions of businesses, from world-leading enterprises to MSMEs and woman-led businesses, the Asia-Pacific has become a driver of economic growth, and the hub of investment, science and technology, contributing to nearly 50 per cent of global investment and trade and almost 60 per cent of GDP. The APEC business community also plays a pioneering role in the development of new technology and energy industries, business cooperation, and next-generation trade and investment issues, bringing about greater resources to better meet the people’s material and cultural needs. We are living in a rapidly changing world characterized by fundamental shifts. Peace, cooperation and development remain the prevailing trend, yet we are still confronted with many serious difficulties and challenges. Nearly ten years has elapsed since the global economic and financial crisis. Economic recovery has become firmer, but there remain potential mid-term and long-term risks. Given the deepening globalization and the fourth industrial revolution, the benefits of growth and technological development have not been equally distributed. Hundreds of millions of people in our region still live in poverty, with unprecedented impacts from climate change and natural disasters. Yet, our region is blessed with vast potential in economics, culture, history, natural resources, and particularly human resources. Hence, we have every reason to believe in a bright regional outlook. Our region is home to more than half of the world’s Top 20 economies and is expected to account for 70 per cent of the world’s GDP by 2050. With the determination of the business community and member economies, APEC can reach higher and go further, bringing about greater prosperity to the people in the region and materializing the prediction that the 21st century is “the Asia-Pacific Century”. During the past years, particularly the nearly one year of APEC 2017, Vietnam has worked with other member economies to develop and implement a wide range of meaningful cooperation programs and activities for the people and for businesses on human resources development in the digital age, the development of MSMEs, cross-border e-commerce facilitation, promotion of the internet and the digital economy, and financial, economic and social inclusion. Our overarching goal is to promote people- and business-centered development. First, our top priority is to generate further the momentum of global economic integration and recovery, uphold its leading role in trade and investment liberalization, and fulfill the Bogor Goals by 2020. Public-private partnerships should be strengthened to promote comprehensive and inclusive connectivity, develop quality infrastructure, and enhance supply chain connectivity as well as next-generation trade and investment issues. From this Forum, I would like urge businesses to enhance cooperation and support member economies in promoting investment in education and training so that our economies and employees can better adapt to the new economic environment. In the long term, investing in people will help ensure social consensus on trade and investment liberalization. This is a prerequisite for businesses to take advantage of opportunities from globalization and expanding their investment and trade on a global scale. Vietnam has scored enormous successes in its 30 years of renovation and nearly 20 years of membership in APEC. From a less developed country, Vietnam has become a developing middle-income economy, and an important link in the network of 16 free trade agreements. As an economy with a high level of openness, the future of 90 million Vietnamese people is increasingly linked to the future of the Asia-Pacific. Many APEC member economies will continue to be among Vietnam’s biggest investors and leading trade partners. In the years ahead, Vietnam will continue to carry out comprehensive reform, with three strategic breakthroughs to improve market economy institutions, promote quality human resources development, and develop a modern infrastructure system. At the same time, we need to focus on transforming the growth model, developing the knowledge economy and advanced technology, and modernizing agriculture, supporting industries, the maritime economy, and tourism. We also place importance on fine-tuning the institutional, policy and legal frameworks, protecting the environment, providing an enabling business environment for all sectors, releasing all the potential of businesses, enhancing law enforcement and upholding the rule of law. Along with comprehensive renovation, Vietnam continues to deepen its international integration and make active contributions to multilateral mechanisms. After eleven years, this is the second time Vietnam has had the honor of hosting APEC, representing a vivid example of our commitment to the international arena. The State and people of Vietnam highly value the support of the APEC business community to Vietnam during our 30 years of renovation. Many businesspeople present here today have come to our country from the first days of our open-door policy. We thank you for your support to help us overcome the difficulties and challenges over the last three decades and make the achievements you can see today. As a business community with a high level of adaptability, APEC businesses will certainly continue to prosper amidst a time of strong volatility. We hope that you will continue working with us to generate new momentum for regional growth and integration, so that the future of the world in the 21st century will truly begin in the Asia-Pacific. On this occasion, I hope that you will take some time to visit Da Nang city and world cultural heritage sites such as the Cham Towers in the My Son Sanctuary, the Complex of Hue Monuments, and particularly Hoi An ancient town, which made its name on the world’s nautical map in the 17th century as one of the most bustling trading ports of the region.